On September 29, 1957 the Green Bay Packers not only played their opening game of the new NFL season, but achieved a significant milestone in the history of the franchise as well. 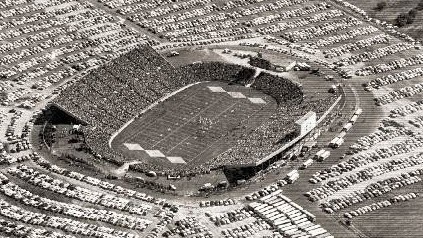 That day marked the official opening of a new home venue, City Stadium (or New City Stadium, to distinguish it from its predecessor, until renamed Lambeau Field in 1965). The Packers had endured mediocrity on the field throughout the decade of the fifties and the future of the franchise was in question. They were playing home games at a high school stadium, the original City Stadium, and owners of other NFL teams were complaining that the facility was no longer up to league standards. The Packers had also been playing some home games in Milwaukee each year (and would continue doing so until 1994), and there was sentiment to move the team there permanently. Upon receiving an ultimatum from the NFL, a bond issue was put before the voters of Green Bay to build a new stadium and received 70 percent approval. The result was the new 32,000-seat stadium. As for the team itself, the Packers were coming off a 4-8 season in 1956 and had not posted a winning record since 1947. 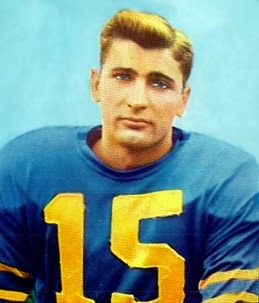 Coached by Lisle Blackbourn, who was commencing his fourth year at the helm, the team had traded star QB Tobin Rote to Detroit during the offseason and was going with 23-year-old second-year QB Bart Starr to start the opening game, although 28-year-old QB Babe Parilli, who had started out with the Packers in 1952, gone into the military, and been dealt to Cleveland, was back with the club. End Billy Howton was one of the NFL’s best receivers, center Jim Ringo was a solid performer on the offensive line, and safety Bobby Dillon a highly-regarded member of the defense. They also had high hopes for their first round draft choices, QB Paul Hornung from Notre Dame and Michigan end Ron Kramer, but by and large the Packers simply had too many holes on the roster. The team they were hosting, the Chicago Bears, was coming off a 9-2-1 record in ’56 that had topped the Western Division, although they lost badly to the Giants in the NFL title game. Coached by Paddy Driscoll, the Bears had a fine quarterback tandem in Ed Brown and George Blanda with Zeke Bratkowski now in the mix after a stint in the Army. FB Rick Casares had led the league in rushing and end Harlon Hill was an outstanding deep threat. Dignitaries were present for the stadium dedication, including Vice President Richard M. Nixon who pronounced the new facility the “best spectator stadium” he had visited. A capacity crowd of 32,132 was on hand on a windy but sunny day. The Bears scored first on their third series in the opening period, following an interception of a Bart Starr pass. Ed Brown capped a 77-yard drive with a five-yard run on the ninth play. Blanda added the extra point and it was 7-0 heading into the second quarter. 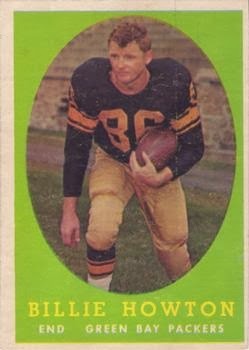 Starr was struggling and the Packers were also hurt by the loss of FB Howie Ferguson to an injury in the first quarter. Babe Parilli (pictured below) relieved at quarterback and the Packers put together a scoring drive that went 79 yards in 10 plays, the biggest a pass that Howton caught over his shoulder for a 37-yard touchdown. Fred Cone tied the score at 7-7 with the successful point after. Chicago got another TD, again taking nine plays to advance 72 yards and scoring on a pass from Brown to Harlon Hill from eleven yards out. The second TD for the Packers culminated a nine-play, 59-yard drive that was helped by a pass interference call in the end zone after Chicago DHB Vic Zucco hit Howton in the end zone. With the ball at the one yard line, Cone dove into the end zone and added the extra point that made the score 14-14 at the half. Early in the third quarter, George Blanda kicked a 13-yard field goal for the Bears to give them the lead, but the Green Bay defense began to assert itself. In addition to intercepting four passes during the second half, the Packers also made a key stop in the fourth quarter. On a fourth-and-one play near midfield, Chicago HB Bobby Watkins was unable to gain the necessary yardage and the Packers came alive with a three-play, 49-yard series that proved to be decisive. Parilli first threw to Howton for a 41-yard gain and Cone ran for two yards. Then Parilli, breaking free of DE Jack Hoffman, fired the ball to end Gary Knafelc, who dropped to his knees between the goal posts and caught the ball squarely in his stomach for a six-yard touchdown. With 8:21 remaining to play, there was still plenty of time left, but Green Bay’s defense rose to the occasion and the Bears were unable to get into Packers territory for the rest of the game. Chicago’s last opportunity came when the Packers had to punt with two minutes remaining, but HB Perry Jeter fumbled when hit hard by DE Jim Temp and center Larry Lauer recovered for the Packers, who were then able to run out the clock. The Packers came away with an upset 21-17 win. Chicago led in total yards (362 to 297) and first downs (19 to 16). However, the Bears also turned the ball over six times, with most coming in the second half, to four suffered by Green Bay. Babe Parilli completed 9 of 17 passes for 197 yards and two touchdowns and Billy Howton had 8 catches for 165 yards and a TD. Chicago’s quarterback combo of Ed Brown and Zeke Bratkowski gave up five interceptions, two of which were by Bobby Dillon. While it made for a great opening in a new facility, the win over the Bears did not mark a turnaround for the Packers. They lost their next three games and ended up at the bottom of the Western Conference with a 3-9 record. Coach Blackbourn was dismissed, but it would take an even worse finish in 1958 and another coaching change to bring about a revival in the team’s fortunes. The loss did presage a down year for the Bears, who sagged to 5-7 and fifth place in the conference, although they did beat Green Bay in the rematch at Chicago. The drop in fortunes persuaded owner George Halas to come out of his two-year coaching retirement in 1958. Babe Parilli started one game for the Packers in ’57 and returned to the bench to back up Bart Starr. For the year, he completed 39 of 102 passes (38.2 %) for 669 yards with four touchdowns and 12 interceptions. He played one more season with Green Bay, was cut during the 1959 preseason and played in Canada, and then spent 10 years in the American Football League with the Raiders, Patriots (where he had his greatest success), and Jets. Billy Howton had another fine season in 1957, catching 38 passes for 727 yards (19.1 avg.) and five touchdowns. He received consensus first-team All-NFL recognition for the second straight year and was named to the Pro Bowl for the fourth time. As for City Stadium, the bond issue that financed its near-million dollar construction cost was paid off in 1978. Following several expansions, and the renaming to Lambeau Field, the seating capacity has since risen to over 73,000.